LONDON, Ontario (Reuters) - Canada is increasingly convinced that President Donald Trump will soon announce the United States intends to pull out of NAFTA, two government sources said on Wednesday, sending the Canadian and Mexican currencies lower and hurting stocks. 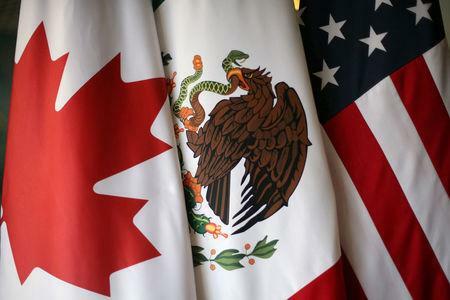 It is not certain the United States would quit NAFTA even if Trump gave the required six months' notice, since he is not obliged to act once the deadline runs out. Notice of withdrawal could also raise opposition in Congress. But even the prospect of potential damage to the three nations' integrated economies sparked market concerns. The Canadian dollar weakened to its lowest this year against the greenback on Wednesday as the NAFTA concerns tempered bets that the Bank of Canada will raise interest rates next week. Mike Archibald, associate portfolio manager at AGF Investments in Toronto, cited "a tremendous amount of uncertainty on the horizon". Canadian government bond prices rose across the yield curve and railway, pipeline and other trade-sensitive stocks weighed on the country's main index. Mexico's currency also weakened and stocks extended losses. The S&P/BM IPC stock index <.MXX> fell about 1.8 percent. "There's been chatter in the market going into this week that it was coming up," Quincy Krosby, chief market strategist at Prudential Financial in Newark, New Jersey. Royal Bank of Canada's Chief Executive Dave McKay said on Tuesday he believed there was now a greater chance that NAFTA could be scrapped. "The government is increasingly sure about this ... it is now planning for Trump to announce a withdrawal," one of the sources, who asked to remain anonymous because of the sensitivity of the situation, said. Separately, a U.S. source close to the White House quoted Trump as saying "I want out" as the talks drag on with little sign of progress. A White House spokesman said "there has been no change in the president's position on NAFTA". The head of the U.S. Chamber of Commerce said that economic gains made through tax cuts and the lifting of business regulations would be undone if the U.S. canceled trade deals, including NAFTA. General Motors Co shares fell 2.4 percent. The Detroit automaker has 14 manufacturing facilities in Mexico, including one that builds large pickup trucks, among the automaker’s most profitable vehicles. Trucks built there could be subject to a 25 percent tariff if the U.S. exits NAFTA. "We have always said that this is a possibility,” a Mexican government source with knowledge of the talks told Reuters, referring to the prospect of a U.S. withdrawal. Mexico's Economy Ministry declined to comment on the report, a ministry spokesman said. Scott Minerd, Global Chief Investment Officer at Guggenheim Partners, said "if Trump were to announce a NAFTA exit, the stock market would probably pull back by 5 percent or so before advancing to new highs. Most likely the Canadians are reacting to the President's negotiating posture." The Canadian sources said that if Trump did announce the United States was pulling out, Canada would stay at the table, since the talks would continue at a lower level. Mexico has previously said it would walk away if Trump formally announced Washington intended to quit. Canadian officials say if Trump does announce a U.S. withdrawal, it could be a negotiating tactic designed to win concessions. The talks are scheduled to wrap up by the end of March. A spokesman for Canadian Foreign Minister Chrystia Freeland - in overall charge of U.S.-Canada relations and the NAFTA file - was not immediately available for comment. Separately, Canada launched a wide-ranging trade complaint against the United States, the World Trade Organization said on Wednesday, in a dispute that Washington said would damage Canada's own interests and play into China's hands.